College had its way with Andrew’s body. When the party was over he repaired the damage and created new, healthy habits. See how he turned his party pack into a sculpted six-pack! 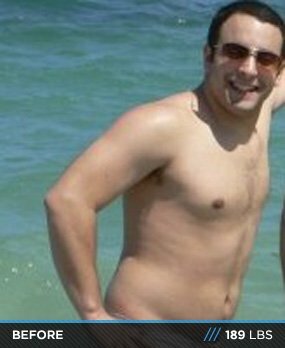 I graduated from college in June 2009, came home from school at 189 pounds, looked in the mirror, and really recognized how much damage all the partying and bad eating habits did to my body. I had never been into weightlifting before, but I knew it was time to make a change for myself. I started going to the gym, learning how to properly use the machines and weights, as well as figuring out lifting routines. Before long, I became entrenched in the lifting lifestyle. I was noticing the changes to my body, my confidence level, and my overall outlook on life. I realized that bodybuilding had become an integral part of my life and have been going consistently ever since. I have to give a lot of credit to my trainer. He set me up with multiple routines for each body group. With time and practice, I got comfortable with the exercises. Then I started to create my own routines that I felt most comfortable with and have stuck by them for years. The first year and a half was purely lifting and I didn't focus on dieting. Once I hit a certain point, I decided I needed to implement a more strict diet in order to push myself further. I went back to my trainer who set me up with a diet designed around eating below standard maintenance in order to cut weight and gain definition. With the combination of increased cardio work, playing basketball every Monday, Baseball on Sunday, and continuing to be at the gym four days a week, I've been able to cut the extra weight. It has brought me to where I am today! Set goals to reach for your accomplishments. It always helped keep me motivated to strive for that next checkpoint. Know what you're doing. If necessary, have a trainer show you the proper ways to do exercises to maximize efficiency. Don't be afraid to have a re-feed day to enjoy some other foods once in awhile; it quenches your cravings and allows you to stay on your diet longer. Lastly, enjoy it! Know that every hard day of work is one step closer to your goals.